Suspended sediment is defined as that portion of a water sample that is separated from the water by filtering. This solid material may be composed of organic and inorganic material that includes algae, industrial and municipal wastes, urban and agricultural runoff, and eroded material from geologic formations (for example, sand and silt). These materials are transported to stream channels by overland flow related to storm-water runoff and cause varying magnitudes of turbidity. Concentrations of total suspended solids (TSS) in mg/L are determined by laboratory analysis of periodic water grab samples. Annual suspended sediment loads are estimated using the computer regression model Regr_Cntr.xls (Regression with Centering). The program is an EXCEL adaptation of the U.S. Geological Survey seven-parameter regression model for load estimation (Cohn et al., 1992). The regression with centering program uses average daily discharge and TSS to estimate annual loads. Bed sediment is composed of particles that are too large or too dense to be carried in suspension by stream flow. These particles roll, tumble, or are periodically suspended as they move downstream. Traditionally, bed sediment has been difficult to quantify due to deficiencies in monitoring methodology or inaccuracies of estimating volumes of sediment being transported along the streambed. This is particularly true in streams that flow at high velocity or in streams with excessive sediment loads. The Proposal must include a cover letter acknowledging receipt of all issued amendments to the RFQ. The letter should be addressed to: Roberta Swann, Director, Mobile Bay National Estuary Program, 118 North Royal St. Suite 601, Mobile, AL 36602. Describe contractor’s experience in projects of similar scope. Provide the names and phone numbers of references for at lest two completed projects for which the contractor acted as consultant and may be considered comparable to the project envisioned in this RFP. For each reference, indicate the contact person’s role in the completed project and the period of their involvement. All proposals accepted by the MBNEP will be reviewed to determine whether they are responsive to the requisites of this RFP. Proposals that are determined by the MBNEP to be non-responsive will not be further considered. The MBNEP will evaluate proposals based on the project selection criteria below. A contract will be awarded to the responsible proposer whose proposal is determined to be the most advantageous to the MBNEP, taking into consideration the price and such other factors or criteria which are set forth in this RFP. Greater consideration will be given to proposers that propose a match or in-kind services with their price proposal. Contract award will be subject to the timely completion of contract negotiations between the MBNEP and the selected proposer. 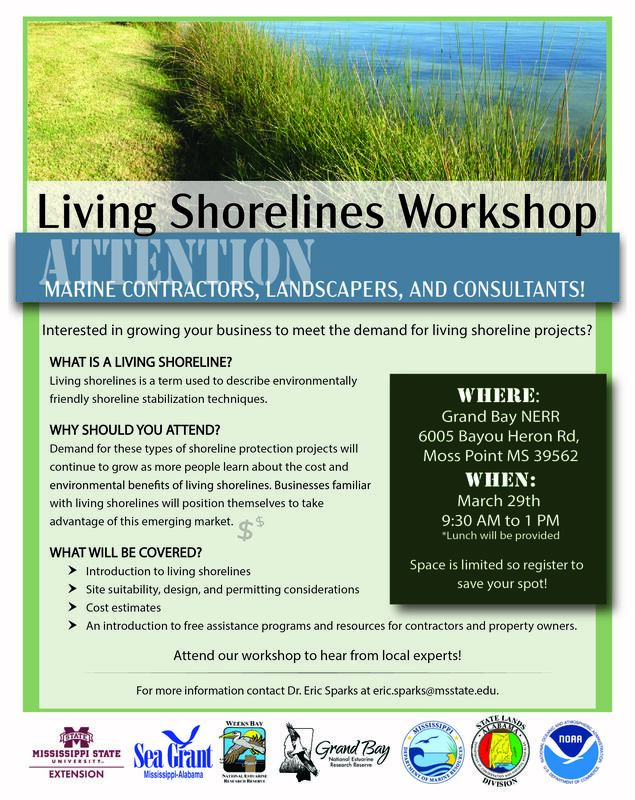 Attention marine contractors, landscapers, and consultants! 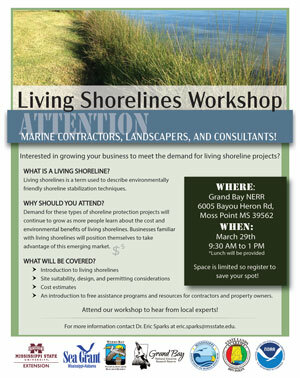 Resources for contractors and property owners. Space is limited register to save your spot! Presented by: Mississippi State University Extension, Alabama-Mississippi Sea Grant, Weeks Bay NERR, Grand Bay NERR, Mississippi Department of Marine Resources, Alabama State Lands Division, NOAA.